Nelson Castillo is an internationally renowned Filipino-American artist, who was born in Alaminos laguna on April 11, 1944. Nelson is married to Lucita Banuelos Castillo, a native from Victoria, Laguna and they have 5 siblings 3 boys and 2 girls. In 1964, Nelson received his Degree in Bachelor of Fine Arts from the University of Santo Tomas in Manila. He began painting miniatures in 1968 and was noted as the “Father of Philippine Miniature Painting” in 1979. In the same year February 6, his first one-man show of miniature paintings at the Manila Peninsula Hotel Fine Arts Gallery was amazingly sold out. Mr. Castillo migrated to United States in 1981 and continued his painting career. He joined several Asian and American Art Associations in Southern California. He teaches art lessons and painting demonstrations in different art associations in the South Bay Area that led to his election as Vice President of the San Pedro Art by the Sea Art Association in 1995. His paintings are in the collection of Hollywood celebrities like Persiskhambatta, the former Miss India who starred in the box office hit film “Star Trek the motion picture”, singer Al Stewart (“Year of the Cat”), Bob Parkinson and Andrew Friendly (top rated Hollywood producers and writers), and Bernie Wayne (composer of the song “Miss America”) in the Philippines, there are the likes of celebrity Boots Anson Roa, General Alfredo Montoya, Manuel Duldulao, Linda Panlilio and Dr. Rogelio Mandiola. His paintings grace prestigious hotels like the Manila Peninsula, Philippine Village, Holiday Inn, Hilton and the Silahis Hotel. This multi-awarded and talented artist is being honored with the “Artist of the Year” award at the Virgo awards last November 2000, Pamana awards last October 2002 and Reflections XIV on November 2002 in California. Currently, he has more than 100 awards and recognitions from different local and national art competitions. 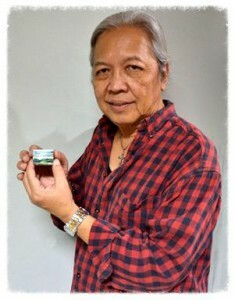 Last July of 2011, Nelson Castillo was interviewed and showed his mini-paintings in GMA’s television show Kapuso mo Jessica Soho’s episode “Small World”. Nelson latest art exhibit was held at the Philamlife last January of 2012 with his son Janddie and grandson John Clark JC Castillo and the art exhibit was entitled C3G Three Generation: Father, Son and Grandson art show and that time he was interviewed and televised in Vicky Morales GMA’s channel 11 news tv show “Good News” episode “Ang mga Small but Terrible na mga Bagay” and recently with his son Janddie on GMA7 Drew Arellanos AHA! show “Small but Terrible” paintings episode and TV5 Joey de Leon Hayop sa Galing show last June and July of 2013. Nelson and his son Janddie was featured again their miniature masterpiece last March of 2015 at Derek Ramsey TV5 show Extreme series Kaya mo To! 2003 : TENTH ONE-MAN SHOW – Gallery & Books – Los Angeles, California U.S.A.
1993 : EIGHT ONE-MAN SHOW – San Gabriel Fine Arts Gallery – San Gabriel, California U.S.A.
1983 : SEVENTH ONE-MAN SHOW – TASA CAFE Gallery and Restaurant – L.A. California U.S.A.
1982 : SIXTH ONE-MAN SHOW – Coconut Groove, Ambassador Hotel – L.A. California U.S.A.
1982 : FIFTH ONE-MAN SHOW – Modern Art Gallery – Los Angeles, California U.S.A.
1981 : FOURTH ONE-MAN SHOW – Luzon Art Gallery – Los Angeles, California U.S.A.
OTHERS : Several Group, Invitational, Beach, Street Scene and Expo Art Exhibitions in the Philippines and in the United States. From different American and Filipino Juried Art Competition both Local and National in United States and in the Philippines.